Our entertainment is over at last. That dialogue went off alright. I didn’t forget any of my part although I was rather doubtful about it. . . The McEwensville Schools had a high school on the second floor and a primary school on the first floor. The show may have included students from both schools. If so, Grandma’s little brother Jimmie probably was in the show. You ARE NOT a blockhead! Don’t put yourself down. PLEASE—THINK POSITIVELY ABOUT YOURSELF. You are darn smart—I can tell that even a hundred years later from reading your diary. Posted on December 12, 2013 December 11, 2013 by SherylPosted in McEwensvilleTagged family history, genealogy. Helena’s expression “by gone days’ makes me smile; she writes as though her school days were decades ago. Going back can be rough sometimes. To me – everything appears smaller than I remembered. I can remember feeling like an outsider when I visited my high school the year after I graduated. Kind of a ghostly feeling to it. I had the same thought as Gallivanta: Grandma sounds as though it had been YEAR since she’d been in school. Grandma does seem to be down on herself often, doesn’t she? If she could only have known that, one hundred years later, she’d have her own “fan club”…. Oh, I don’t want to hear her refer to herself as a blockhead either! Even in jest. My grandmother was the same way. Let’s see, they still haven’t been “given” the right to vote yet, right? Maybe she will feel a bit more empowered when we get closer to the 1920s. Yes, women didn’t get the right to vote until 1920. Even though Grandma never mentioned it in the diary, I still think that she was frustrated that she hadn’t gotten a job as a teacher in a one-room school house. Only a high school diploma was required back then, and both of her older sisters became teachers. Visiting her old high school may have reminded her of her unfulfilled dreams. Isn’t it interesting — working with family history — how we begin to feel like we are right there with them. I know I feel that way in working on “My Father’s House.” It is, of course, impossible, but I feel like I’m right beside the young man who will someday be my father. It is kind of a strange feeling. And, as a middle aged woman, I sometimes want to lecture the teen-aged girl who wrote the diary when she made poor decisions or wrote things I disagree with. Then I remember that this is my grandmother–and that she should be lecturing me, not the other way around. It certainly make real the continuity of life — how we are literally connected both to the past and to the future. This fan sees you as a smart, intelligent woman. Believe in you. Its nice that the school building is still standing. 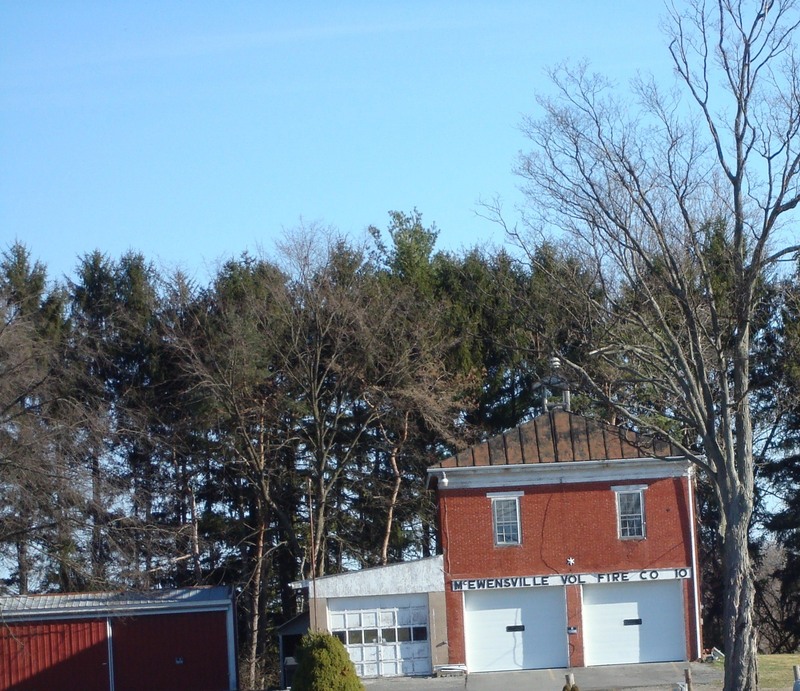 It is amazing how many of the old buildings in McEwensville still exist. The school closed in the late 1950s. It was then used by a volunteer fire department for many years. It now sits empty–though I think that the owner may be trying to remodel and repurpose the building. I remember feeling nostalgic about visiting my old school for the first few years afterwards. Whereas now, having moved past that era of my life, it conjures up a period of uncertainty (adolescence) and I would not want particularly to revisit that place. I visited my high school the year after I graduated–and have never gone back since then. She makes it sound like she’s been out of school for years! I guess a few months can feel like a really long time to an 18-year-old. I never revisited my old high school. It’s torn down now and although I miss the building still being there when I drive by, I don’t miss those days at all. The visits I made back to school in the first years after graduation were interesting. You still saw people you knew at the school. A visit about ten years later was a little sad as many of the teachers had retired. That building looks pretty darn good for 100 years old (or even older). I see it’s a fire station now. I wonder if your grandma ever though about what the future would be like now.